St. Joseph’s students flourish in small classrooms. Lakota (Sioux) families reach out to St. Joseph’s Indian School for their children. Parents, grandparents, guardians and caregivers know St. Joseph’s provides more than just a safe home. 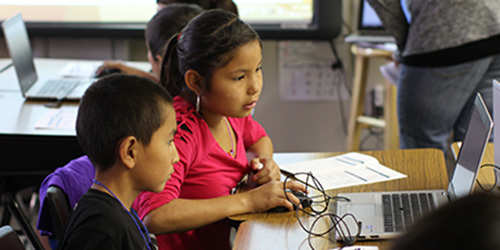 From cultural integration in daily living, to specialized counseling services, we provide Native American boys and girls programs as unique as they are. St. Joseph’s is blessed to have the best and the brightest educating our students for life — mind, body, heart and spirit. Children attending St. Joseph’s benefit from individualized care plans that follow nationally approved and accredited techniques. Friends who support St. Joseph’s help provide for every aspect of each child’s physical, emotional, spiritual and educational needs. Over 200 boys and girls call St. Joseph’s their home-away-from-home. Children in elementary grades one through eight attend classes at St. Joseph’s Elementary School on campus. Children benefit from small class sizes (approximately 12 students per classroom) and one-on-one attention. Technology is carefully integrated into the learning environment! After eighth grade, students can enroll in St. Joseph’s High School Program. With capacity to care for 50 Lakota (Sioux) high school students, St. Joseph’s partners with Chamberlain High School to give our students a multitude of opportunities to participate in sports, fine arts and extra-curricular activities. In addition, they still live on St. Joseph’s campus with our specially-trained houseparents. According to a 2015 report from the Native American Student Achievement Advisory Council, only 46% of Native American students in South Dakota received a high school diploma in 2014. In contrast, eighth grade students who graduated from St. Joseph’s Indian School in 2010 show a graduation rate of approximately 95.5%. This alarming number solidifies the importance of education starting in elementary years. Children at St. Joseph’s are encouraged to be passionate about their education through special awards, recognition and fun activities. Integrating the children’s Native American heritage into their classroom experience also plays an important role in their healing and growth. Native American Studies is a required course for all St. Joseph’s students; in this course, children find themselves immersed in culture by learning the Lakota language, traditional stories and more. Additionally, Native American beliefs and philosophies are incorporated into core curriculum classes like math, science and language arts through careful lesson planning and the WoLakota program. The WoLakota program “provides a cultural thread in the classroom," said Kathleen, St. Joseph’s principal. "With 100% of our students being Native American, it’s particularly important at St. Joseph's that we do everything we can to help students embrace their heritage. One of the first steps is making sure all our staff members — native or otherwise — understand how important those roots are. This project gives teachers the tools they need to present on a variety of cultural topics with confidence." Embracing diversity and cultural understanding lends a new perspective, which can be beneficial to students and staff of any background. "Today’s world requires that we have perspective from many sides of any given situation," said Kathleen. "We must see where they meet and then decide which path is best for us. That’s what we hope to teach our students."